Magog, QC, October 12, 2017 – Camso is expanding its current collaboration with Yamaha Parts and Accessories, a division of Yamaha Motor Canada, to offer track conversion systems to dirt bike and ATV owners. 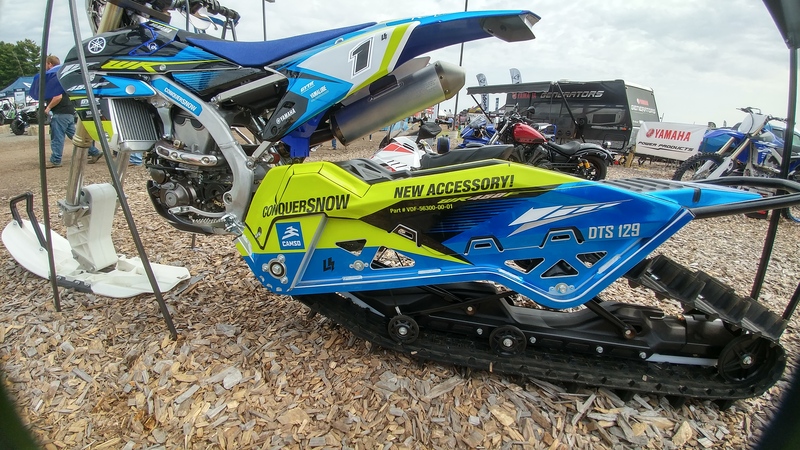 Powersports enthusiasts riding Yamaha’s WR450F™ dirt bike in Canada will now be able to enjoy their vehicle year-round when equipped with the Camso DTS 129 dirt-to-snow bike conversion system. On the all-terrain vehicle side, owners of the new Yamaha Kodiak 450® will have access to a broader playground with the Camso ATV R4S system available as an option. This new recreational four-season system has been especially designed for small-cc’d vehicles. These two new track systems ensure all-season mobility for Yamaha customers. “Yamaha Motor Canada and Camso enjoy a very positive relationship in support of our dealers and customers. We are pleased to expand our current collaboration and provide more innovative opportunities for our customers,” says Peter Smallman-Tew, Vice President, Sales & Marketing, Yamaha Motor Canada. The Camso DTS 129 and ATV R4S will be available through Yamaha Canada’s authorized dealer network, using the same distribution model as the existing agreement with Yamaha for sales of Camso’s ATV T4S and UTV 4S1 systems.